Lumineer Texarkana | Cosmetic Dentistry Texas | Dentist Arkansas - Andrew S. Curry, D.D.S. 20% Off Special For Veneers In March & April! Get Your Beautifully Shaped, Hollywood Smile! Having bright and healthy teeth can make you feel more confident about the way you look. Dr. Andrew Curry is committed to helping you achieve the best smile. For a beautifully shaped, Hollywood smile, we recommend Porcelain Veneers. Call our office or contact us here to schedule a free consultation! Transforming your smile couldn’t be any easier. Are you looking for a non-invasive way to enjoy a more confident smile? Ultra-thin LUMINEERS are custom designed to give you the beautiful smile you’ve always dreamed of. Cosmetic dentistry has come a long way, and unlike traditional veneers, there are no shots, no drilling of sensitive tooth structures and no pain with LUMINEERS. They’re even reversible, so you have nothing to lose and only a beautiful smile to gain. LUMINEERS and Veneers — What’s the Difference? Don’t settle for just any veneers — you deserve the best! While veneers are wafer-thin, LUMINEERS are even thinner. 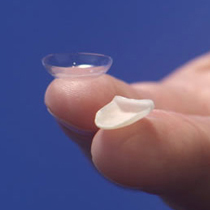 As you can see in the image above, they are roughly equivalent to the thickness of a contact lens. Even though LUMINEERS are thinner than traditional veneers, they are still durable and stain resistant. Veneers are bonded to the teeth, and in order to make room for the veneer on the surface of the tooth, approximately 0.5 mm of the original tooth will need to be removed. LUMINEERS, on the other hand, are so thin that they don’t require any enamel to be removed, and therefore, they are less invasive, faster to apply and won’t damage your teeth. However, if applied by an inexperienced or unqualified dentist, LUMINEERS can feel bulkier on the teeth than veneers. That’s why it’s important to turn to a dentist you can trust for your LUMINEERS. Veneers are done for a variety of reasons, including correcting discoloration, straightening the appearance and brightening your smile. Veneers are tightly bonded to your tooth and are highly resistant to staining from coffee and tea. The result is an aesthetically pleasing and natural smile! Veneers are an excellent alternative to crowns in certain cases. Veneers can help with a gap between teeth for many patients. As you can see, LUMINEERS can help to correct many dental issues that could be adversely affecting your smile. With LUMINEERS, you could enjoy a more beautiful, more confident smile without having to undergo more invasive dental procedures and treatments, like braces, teeth whitening and more. However, LUMINEERS are not the right option for every patient, and before you decide to go with LUMINEERS, it’s important to talk to an experienced dentist. Our Top Rated Local® dentist in Texarkana, Dr. Andrew S. Curry, is passionate about helping our patients achieve healthy, beautiful smiles. When you schedule an appointment with us, we’ll help you determine which treatment option is the best for you, whether it be LUMINEERS or another procedure. We believe that, when it comes to your dental care, it’s important to be informed about all of your options, and we’ll go over them with you in detail so that you have the information you need to be the right choice regarding your dental care.